The gripping story of an incredible journey behind enemy lines - told in diary form. Fourteen-year-old Evan Warrender travels with his father to the Dardenelles, where they intend to provide succour to the Allied soldiers. When they are captured by the Turks, they are launched into an epic journey, living on their wits and the kindness of strangers as they escape and travel through Turkey, back to Greece and finally home to Australia. Along the way they meet unlikely friends and companions, some of whom have deep secrets. And when Evan's own secret is revealed, we realise just how incredible the journey has truly been. Evan's fascinating survival story takes readers beyond the frontline and creates an all-encompassing account of this significant time in our military history. Impeccably researched, this is an eye-opening adventure story that cleverly explores both sides of the war. Kerry Greenwood's novels include the Corinna Chapman series and the Phryne Fisher mysteries, recently made into a TV series for ABC1. She is also the author of several books for young adults and the Delphic Women series. When she is not writing she is an advocate in Magistrates' Court for the Legal Aid Commission. She is not married, has no children and lives with a registered Wizard. If a father decided to have his young son accompany him to a war torn country today the authorities would be outraged. It was, however, a different Australia in 1915. Fourteen year old Evan leaves Apollo Bay and his life of innocence for an existence in the trenches of Gallipoli as his father decides ‘..that God wants him to do something..’ and resolves to journey to Gallipoli in an effort to help the soldiers ‘..turn away from wickedness to good..’ Evan is exposed to a world far removed from his Australia, witnessing terrible atrocities. He struggles to look after his father who suffers a breakdown amid the death and destruction. He wrestles with his father’s beliefs and teachings as he watches the world fall apart along with the lives of thousands of innocent young men. This novel is written in diary form and as such enables students to explore a different genre. I saw many parallels with Candles at Dawn by Serpil Ural which also tells the story of Gallipoli from the Turkish perspective. The two novels could be compared and contrasted in Reading Conferences. 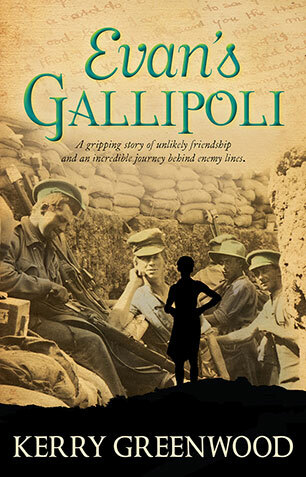 Evan’s Gallipoli is a novel for accomplished readers as the diary format can alienate many students. The Australian National Curriculum specifies that the commemoration of World War One is covered in the Year 9 curriculum, however it is imperative that the ANZAC legend is celebrated in the upper primary levels. It would be of enormous value to read extracts of this novel to Year 5 and 6 students as part of an ANZAC Day inquiry. This book is written in the diary format which allows the reader to develop a strong connection to the character of Evan. Students could complete a mind map in which they brainstorm how the use of diary writing may limit and extend a readers understanding of a character. Students could complete a collage of images that to show the enduring ideas that have been created from their reading of the text. This could then be extended for students to find quotes which embellish the images they have chosen to include. Throughout the text there are many references to other famous texts and people who were involved in this period of history. Students could prepare speeches relating to these texts/ individuals mentioned in the text. Then this information could be present to the class as an overview so that students can recognise the importance of these references to add meaning to the narrative. A mapping exercise is also important for students to recognise the area which is being discussed and as the characters move from one place to another. The map could be added to throughout the study of text as significant places are discovered. Students could also spend time researching significant events from the Gallipoli campaign and finding links to passage in the text. For example The Nek attack August or the evacuation of troops which took place in December. Students could write their own account of these two experiences using diary writing to help them emulate the text. The change of gender on the last page leaves a twist which is unexpected but could be used to promote thought about how the readers understanding of specific events has changed when considering the gender of the protagonist. This could be achieved as a writing task with a limited timeframe. What might a pacifist do during war? After the outbreak of World War One, Evan's father travels to Turkey “on a mission to comfort the soldiers” and fourteen year old Evan goes with him. Evan's mission is to watch over Father as much as it is to help the soldiers. Sleeping in a cave within rumbling distance of the trenches, and where the living conditions are far from pleasant, Evan experiences the war through the eyes and ears of the men who are fighting it. Amidst the dirt and despair, a chance encounter with Abdul serves Evan well when Father crosses into enemy territory and Evan again follows. Where Father goes, so does Evan. And so they soon find themselves caught up in further upheaval as they travel through the countryside, finding shelter in towns along the way, headed via Thrace towards Athens. Upon return to Australia, will Evan be able to adjust from the relative independence of the road, being more parent to Father than he is to Evan? Will a return to Australia even be possible? New experiences of food, local customs, languages and people are all enlightening, but there are also things going on that Evan doesn't understand. And Evan has a secret, one that no one seems to have guessed. Short, easy to read diary entries tell the story of conflict and friendship from an unusual and enticing perspective. References to places and events of the war offer opportunities for readers to explore them further, and to better understand the cultural, religious and social circumstances of both that time and today. The childish style is error-free but typically disjoint in a way that works despite the cultural and historical differences between the writer and the book’s narrator. The book is a short novel in diary form that may appeal to those writers with simple sentence structure. The author has written from the point-of-view of a young Australian Christian immersed in the alien setting of World War 1 in a foreign country. She has done this quite successfully. It begins with an introduction of the narrator and father leading a wandering lifestyle in country Australia. The father decides he should provide comfort to troops at Gallipoli and sets about getting the necessary permissions and supplies. Kerry gives accurate descriptions of the trenches and hospitals. The father decides to go to the Turks and after their capture the two go on a journey behind enemy lines where the teenager has to look after an aging father as well as a young Turkish boy they meet along the way. I liked that Simpson said to them, “You can do anything that they can’t stop you from doing.” It is hard enough for a writer to be the voice of a younger character let alone one from a century ago whose belief system might be at odds with their own. The horrors of battle and war’s affect on the civilian population are dealt with cleverly. “No amount of God’s waters will wash this place clean.”There are quite a lot of references to the landscape, peoples, politics and dangers these wanderers face. I would recommend this book to my secondary students as a model for writing success. After all we are all writers and we all have a story to tell. In 1915, Evan Warrender heads off with his father to the Dardanelles. Since the death of his wife, Evan’s father has largely withdrawn from society, seeking solace in religion. Having read of the Anzacs’ plight, he feels it his duty to bring comforts ─ mustard, lice powder, painkillers ─ to the soldiers at the front. In order to protect his father, fourteen-year-old Evan refuses to stay behind with Auntie Euphie. They travel with the army medical corps via Alexandria and Lemnos where Evan’s aptitude for languages helps them negotiate food, shelter and storage of their cargo. In the trenches, Evan endures danger and hardship but is heartened by the courage and humour of the soldiers. However, the stress of the battlefield causes his father’s mental state to worsen. One day, Evan’s father runs forward into Turkish-held territory. Where his father goes, Evan must follow. Inevitably, they are captured and imprisoned. They escape with the help of Abdul, a young Turkish boy whom Evan has befriended. If they are caught, they may be executed as traitors. As his father succumbs to madness, Evan must steer them towards Greece and safety by relying on his wits and the kindness of strangers. In this novel, Kerry Greenwood upholds her reputation for historical accuracy and exciting storylines. Told in the form of diary entries, this is an adventure with elements of mystery and secrets to be revealed. On a deeper level, strong themes about courage and loyalty emerge. Greenwood’s message is clear: there are no winners in war. Cruelty breeds cruelty and desperation leads to acts of brutality when survival is at stake. The humanity of all those caught up in conflict is worthy of remembrance. Evan’s Gallipoli will appeal to male and female readers spanning junior to senior high school and would be appropriate for studies in English and History. Young Evan and his father travel to Gallipoli to bring comfort supplies to the soldiers fighting there. While there, Evan's father becomes ill and the pair must find their way across war-ravaged countries to Athens in order to sail home. The author Kerry Greenwood has written many bestselling novels and this one is a great read with such an unexpected twist that you don’t see coming right at the very end. I enjoyed the way the book was written in diary form, the concept of the story was gripping. I found myself thinking very deeply about the effect war has on troops. As you follow Evan across Europe and are introduced to many different characters you really live the war experience. It is a good book to initiate discussions of just who are the enemy and as Evan and his father are pacifists it brings many themes to discuss with children. Evan and his father are of Christian faith and have an unwavering belief that what will be, will be. Evan befriends a Turkish boy around his own age and as their culture and religious views is very different, the need to stay alive makes this friendship very important and therefore we get a wonderful insight into society. The way history is intertwined within the story is brilliant with Simpson and his donkey as one such example. A great deal of historical information is contained within this novel and this would be a valuable resource to any students’ knowledge. The story is written is a way that the reader can picture the scene of the Gallipoli battle and even the smell and sound is conveyed to you. This book would be a good novel to study by grade 7-10 students as it is easy to read but still is well written to hold your attention. The cover of this book describes it as “a gripping story of unlikely friendship and an incredible journey behind enemy lines”. “Unlikely” and “incredible” it certainly is — I can’t agree about the “gripping story” however. Having heard Kerry Greenwood speaking on Radio National about her backgrounding this novel, I can attest to her passion for the whole Gallipoli saga. Her painstaking research is displayed throughout the book in her attention to geographic detail, her use of the vernacular in the dialogues and her frequent historical allusions. But this is such a far-fetched story! The idea of an Australian Christian pastor being so incensed by news from the front that he’s compelled to go to the Middle East, accompanied by his young “son” to keep an eye on him as he travels through enemy territory is just preposterous. Reading this novel was for me a wearisome task and I’d not have persevered were I not reviewing it. The ending, however, is a real cracker! A wonderful surprise, reward for sticking with the text through the tedium. A brief bibliography completes the book. It is a well-bound paperback with comfortable fonts and some black-and-white photographs, and sepia reproductions of contemporary newspaper accounts on its endpapers. I’m afraid I can’t really recommend this book. At the tender age of fourteen, Evan Warrender accompanies his father to the Dardanelles. Their aim is to provide the troops with “treats” such as spices to add to their meals and lice powder to make them more comfortable. His father preaches to the troops, encouraging peace and love of God. On their travels they meet a young Turkish boy who joins them on their journey. Life at the front proves to be far more confronting than Evan’s father is prepared for. When his father suffers the effects of shell shock, Evan takes on the roles for which his father has previously been responsible. He displays maturity beyond his years as he negotiates with the varied soldiers, leaders and characters they encounter. Amongst the fishermen, gypsies and refugees, they also meet and travel with a peddler who magically appears when most needed to help them out of some scrapes. Greenwood has created a wonderful set of characters, made the settings through which they travel believable and somehow makes the reader feel part of the action…one almost feels tempted to scratch at lice whilst imagining some of the fairly awful foods provided in the army camps. There are several twists and turns throughout the story with a major twist revealed only in the final pages. Personally, I was pleased to read the conclusion as I’d found some earlier related issues somewhat unbelievable however this made it all feel plausible. Thanks to the National Curriculum and the strong history focus of this title, I would happily use this as a class novel with upper primary students. I would probably focus on war and the perspectives of the different characters and groups of people who appear within the pages. Students could consider the roles of males and females, the various cultural groups, pacifists, soldiers and so on and perhaps write some poems or reflections based on their viewpoints. Due to the diary form, this could also be used when looking at other books with the same format. This historical fiction offers fourteen year old Evan's perspective on World War I as he and his father cross over from the Allied camp at Gallipoli to the Turkish side. With the help of Evan's new friend Abdul, they escape from a Turkish commander who held them captive. The three try to lie low while travelling through Turkish villages in the hope of eventually making their way back to safety. They meet many locals and experience the war first hand from the other side. When his father's clarity of mind wavers due to illness, Evan takes on the role of guide and protector. His first person journal entries tell of their experiences with clarity and directness rather than surprise or excitement, perhaps because although they are constantly encountering new and unusual sights, Evan must keep his wits about him. This lack of embellishment lends authority to Evan's account, though the absence of dialogue in the journal format may make it more arduous for younger readers. Evan and his father are far away from home. How did Evan find this hard? What do those in Australia think the war is like? The Turkish villagers lived very close to the battlefield; how did the war impact their daily life? Many soldiers were injured in the war; what were the different ways some of them reacted to their injuries? Evan mentions books and reading several times in his journal. Why were books important to Evan? How do you think his reading helped him write his journal? How has Evan's view of romances and exotic stories changed by the end of his trip? Why do you think it changed? Why were Simpson and his donkey noted in particular for their work? Find out more about Edith Cavell. Prostitutes are mentioned several times as a fact of life in Turkey, without much detail. At one time Evan and his father take a room in a hotel which turns out to be a brothel, noted as such only for its sweet smell, the noise, and the many women. Evan is tempted to kill an injured German soldier who has threatened to turn Evan and his father in as traitors unless Evan helps him escape. Not believing there was anyone else he could turn to, and not wanting the German to escape, Evan decides to carry it out by bringing the German morphine in orange juice. He is stopped at the last minute by an adult who, unknown to Evan, understands his predicament and solves it for him. Evan is remorseful for his sinful intention, but also questions what else he could have done. An injured soldier commits suicide on the ship home to Australia, fearing to face his family and sweetheart with his injury. Evan thinks the soldier is happier now in heaven, though is father thinks the suicide was a sin. At the end Evan (the son of a preacher) finds a book called 'Does God Exist?' and he considers that if God did not exist it would explain much about the world. He also notes that God’s non-existence would rule out the possibility of heaven, which he thinks is 'too much to bear'. In the lead up to the celebration of the ANZAC tradition it is wonderful to see new offerings in the area of adolescent fiction. Kerry Greenwood has been writing engrossing novels for young and not so young for quite some time and this one is no different. This story traces the journey of Evan and dad from being providores for those living off the beaten track in outback Australia to providing relief packages to the soldiers at Gallipoli. They take across supplies of lice killer, spices and more in an attempt to make life more bearable. Dad begins to experience symptoms of shell shock and takes off across no man’s land to preach to the enemy, thus beginning a life on the run as traitors. The rest of the novel deals with their journey through Turkey, Thrace and more back to Greece and finally home. Evan needs to guide dad and a young Turk through the perils of moving through enemy territory. While many novels about the era focus on the battle this one focuses on the relationships between people and the similarities and differences between all those that Evan and party encounter on their journey. The new fiction in this area takes a different perspective from the novels of old- the role of women and children are being given more emphasis and the whole narrative is beginning to see the light of day. Would be great to use within the Australian Curriculum cross curriculum focus. Evan's Gallipoli is a captivating read for a target audience of teens. We see the atrocities of war through the eyes of fourteen year old Evan, who is travelling with his father on a Christian mission of mercy in Turkey in 1915. Although the story is fictional, it is solidly based on historical facts. On the journey Evan meets the legendary Simpson and his donkey, befriends a young Turkish boy named Abdul and Australian soldiers Bluey and Curly, amongst many others of different nationalities. Evan bravely battles through every challenge he faces, including supporting his father through illness. His well-rounded education, especially his knowledge of several languages and love of reading books are crucial to his survival, as are his faith in God. Evan writes in his daily diary on October 17th: “All I can see is the harvest of war. Dead and mutilated men. Burnt fields. Lost children. Starving mothers. Madness.” (page 134). Such a contrast to his normal life in affluent Australia! This historical novel would be a great addition to a study of the ANZACs and the resilience of individuals who have survived war.